Recently I noticed the "Review queues" button (on SO) for the first time, as it had a red button on top of it (I don't know if I gained the ability to review recently or not). I clicked on it to see a menu pop up, then clicked on "All queues" to see a screen with number of queues, with top 3 ones which I could access and review. They all had 0 posts. I've noticed it again (it being red circle), and again clicked on it - to see same as earlier - 0 posts. When I refreshed (after a second) the queue was populated with 11 / 5 / 3 posts. After another refresh (again after a second), all of them dropped to 0 and stayed there. I've started refreshing now and then - and now I'm seeing 14 / 11 / 3 that are not dropping to 0 suddenly - they are decreasing indeed (which is, I guess correct behaviour) but by slight amount after each refresh (or staying on the same number), and not turning to 0 (so I can actually go and see what's in the queue). I also don't have the number of posts in each of queues, which I see in similar questions posted for this. what's the deal with the red dot? if queue is cached, why would it occasionally display "real time" results (like - decrease by 1 for queues) before plummeting to 0 and staying there? 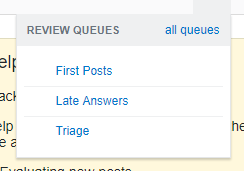 should I be seeing number of posts in queues? See When I look at the review icon, I see red ...essentially, the red dot is now the indicator that there are review queues that you have access to which need attention from you, a potential reviewer. Well, that's been a hot topic and a lot of people want it, but it's currently not designed that way. There's a chance it's being A/B tested and I'm in the B group that doesn't see numbers, currently. See Add numbers back to the review queue drop-down menu for an example of one of the requests (more have been made as answers and in posts on Meta.SE rather than here on Meta.SO. As for your caching question... I can't answer that.